Brisbane’s Story Bridge opened for public climbs in 2005. After a long hike to the top of the bridge, visitors will be rewarded with a view from 80 meters above the Brisbane River. This exciting climb is a rare treat and an experience that guests will never forget. The landscape of one of Australia’s most exciting cities will stretch out before you, and as the sun sparkles off the river and buildings, you will be entranced. The “Story” in Australia’s Story Bridge is John Douglas Story, a prominent Queensland public servant who was born in Edinburgh, Scotland in 1869 and died in Brisbane in 1966. 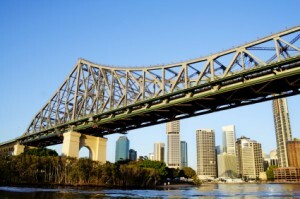 The bridge spans a turn in the Brisbane River and connects Fortitude Valley to Kangaroo Point. It opened in July 1940 and helped to alleviate traffic along the Victoria Bridge and redirect traffic away from Brisbane’s central business district. It is a 777-meter long steel cantilever bridge and is one of only four bridges in the world that allows public climbs. The bridge is open to walkers, runners and bikers as well as vehicular traffic. The view from this iconic bridge is astounding. Visitors will see a 360-degree panoramic view of Brisbane, including Moreton Bay to the east, the rolling hills of Scenic Rim to the west and a birds eye view of some of the best Brisbane accommodation properties on offer. In addition, visitors will see the Glasshouse Mountains and the world famous Lamington National Park. If you choose to do this two and a half hour climb in the morning, you will be rewarded with a view of the sunshine glittering off of Moreton Bay. Guests who choose an evening climb will be awed by the sun-splashed cityscape. Even more exciting, Story Bridge Climb now offers an Abseil Climb. Visitors can climb to the top of the bridge and abseil down one of the bridge’s pylons, landing in Captain Burke Park. Climbers who want more adventure out of their trip to the bridge will be thrilled with this option. Climbs leave every 20 minutes, but the schedule does shift, so it is wise to book ahead of time and arrive 15 minutes before your climb is scheduled to leave. Visitors can listen to an audio tour on the way up and hear a rich and detailed history of Story Bridge. The cost of the climb ranges from $75 to $130, depending on when you go. Dawn and twilight will give the most spectacular views. Midweek climbs are cheaper than weekend climbs, but dawn climbs do not run during the week. Children must be accompanied by an adult, and there can be no more than three children per adult. Personal belongings cannot go with you on your climb. Don’t let fear of heights stop you from ascending this bridge and enjoying the experience of a lifetime. Many people who suffer from this phobia have climbed safely and felt a release from this fear after this experience!